FC Pune City joined the toppers in the Indian Super League after claiming a well-deserved 1-0 victory over Jamshedpur FC here at JRD Tata Sports Complex, Jamshedpur, last evening. 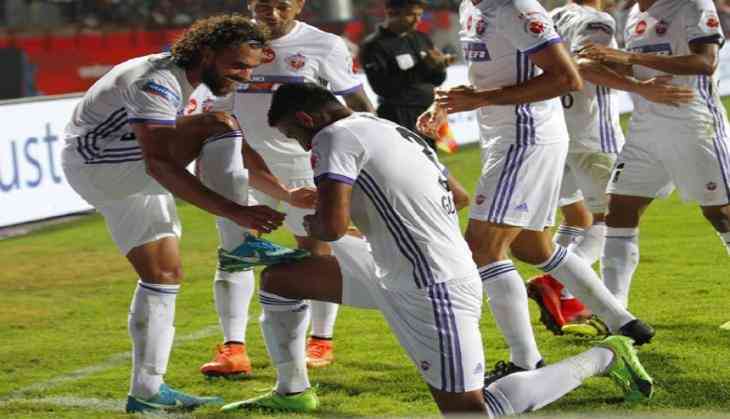 FC Pune City defender Adil Khan's goal at the half an hour mark proved to be the difference between the two sides as Pune registered their third win in five matches to accumulate nine points, the same as leaders Bengaluru FC">Bengaluru FC, FC Goa and Chennaiyin FC. Lalchhuanmawia Fanai was sent off for Pune but Ranko Popovic's side defended resolutely to take all three points and hand Jamshedpur FC their first loss in the league. It took FC Pune City 30 minutes to break through Jamshedpur FC defence that had kept four consecutive clean sheets in the ISL. Mehtab Hossain's foul on Marcelinho gave Pune a chance to launch one into the opposition box where Adil Khan converted at the back post. Pune won the first header from Marcelinho's free-kick and Khan side-footed it home. Steve Coppell's men reacted well after going a goal down. The home team immediately put Pune under an extended spell of pressure and in the 44th minute, they had the ball in the opposition net. Matheus Trindade's cross from the left was turned into Pune goal by Izu Azuka, but the Nigerian was flagged offside before he could celebrate. Two minutes into the second half, Pune had a great chance to double their lead. Emiliano Alfaro released Diego Carlos on the right who drilled in a low cross across the face of goal. Both Marcelinho and Isaac were in the box but failed to turn the ball home. Unable to break through Pune defence, Steve Coppell brought on Kervens Belfort to replace Trindade in the 66th minute but it was Popovic's side that looked likely to pull one more ahead. With just 10 minutes left on the clock, Pune's efforts to take all three points suffered a big blow after Lalchhuanmawia Fanai was given the marching orders for his foul on Bikash Jairu. The Pune left-back was already on a yellow card when he was adjudged to have caught Jairu with his flailing arm. But even with a man down, the visitors held on to their lead to secure full points.